The Trinidad and Tobago Unit of the Caribbean Agricultural Research and Development Institute (CARDI) hosted the 3rd Annual Open Day “Improving lives through agricultural research” on December 02nd, 2011. The day’s activities included an opening ceremony, exhibition and a mini-tour which showcased the work being conducted by CARDI at a Protected Agriculture Operation and Sweet Potato Demonstration Plot. Dr S. Ayyappan, Director General of the Indian Council of Agricultural Research (ICAR) gave a public lecture on how agricultural research and development in India has helped to reduce hunger in that country. The public lecture was held at the Festival Ballroom, Crowne Plaza, Trinidad on October 17, 2011. Roseau, Dominica….The Excellence in Communicating in Agriculture Awards 2011 was presented to the winners of the first edition of the Technical Centre for Agriculture and Rural Co-operation (CTA) Caribbean Awards in Dominica, at the Official Opening of the Caribbean Week of Agriculture and Trade Expo at the National Stadium. The Best News Story (Print) goes to Gaulbert Sutherland of the Stabroek News newspaper of Guyana. The Best Business Feature (Print) was submitted by Shaliza Hassanali of the Trinidad Guardian. The Best Television News story is Carry Bishop of the Jamaica Information Service. The Best News Story (Radio) was won by Antoinette Frederick of WINN FM, St Kitts and Nevis. Roseau, Dominica…You are invited to attend a media conference for the signing of a Memorandum of Agreement between the Caribbean Agriculture Research and Development (CARDI) and the Indian Council of Agricultural Research (ICAR) of India takes place during the Caribbean Week of Agriculture in Dominica on October 14, 2011 at the Fort Young Hotel, Roseau at 4:30 pm. The Indian Council of Agricultural Research (ICAR) is one of the world’s largest organizations dedicated to agricultural research. ICAR was a major driver of the Green Revolution, which in the 1970s doubled food production in many developing countries. India is now self sufficient in food production despite its large population of over 1 billion people and this is largely due to the work of ICAR in the last 40 years. The Caribbean Agricultural Research and Development Institute (CARDI) is the only Caribbean regional agricultural research institute and as such it is recognized by the revised treaty of Chaguaramas. Agricultural lands under threat in the Caribbean The increasing possibility of more arable lands in the Caribbean falling out of production due to salination (lacking in organic content on account of rising sea levels and salt water intrusion) is of great concern to the region’s agronomists. Professor Nazeer Ahmad, Professor Emeritus, University of the West Indies, said some 9,000 hectares of land in Jamaica alone is out of production because of saline water intrusion. The case is even more chronic in some other Caribbean nations. 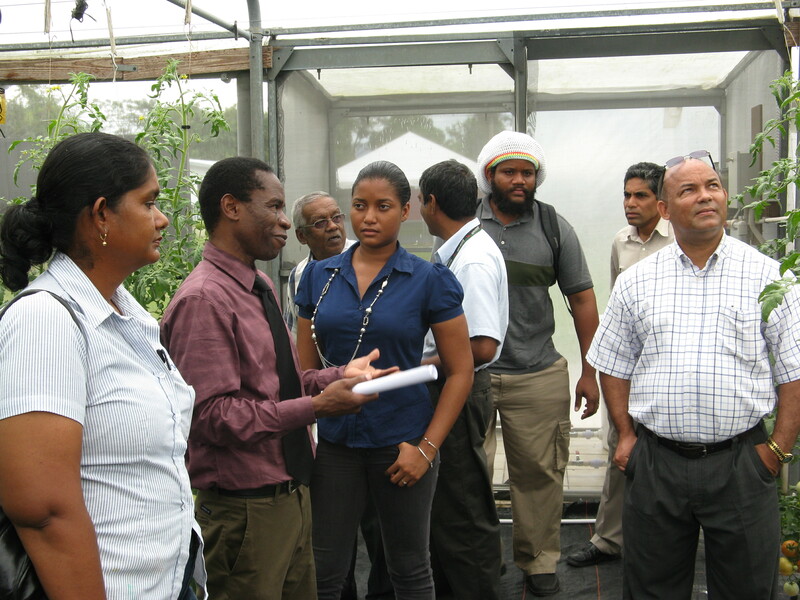 He was addressing the topic of “Soil water management system for a drier Caribbean” at a Climate Change Adaptation in Caribbean Agriculture workshop hosted by the Caribbean Agricultural Research and Development Institute (CARDI) and the Technical Centre for Agriculture and Rural Cooperation (CTA) as part of the CWA activities. Rainwater is King. Expert says rainfall is king both for water supply and agriculture. Caribbean nations must be more cognizant of the importance of its rainwater resources, more so in this era of climate change. That’s the view of the University of the West Indies’, Dr. Michael Taylor as he addressed environment and agriculture stakeholders at the Technical Centre for Agriculture and Rural Co-operation (CTA) Climate Change Adaptation – Water Management workshop, which was held at Roseau’s Pastoral Centre. Organisers of the Excellence in Caribbean Agricultural Journalism Awards 2011 wish to announce the winners of the first edition of the regional awards.